The other day after sorting through the latest haul of thrifted clothing, which should be an article all on its own, I thought to myself ” I seriously have to start making some stuff from all this stuff” But where does one start a project such as this? 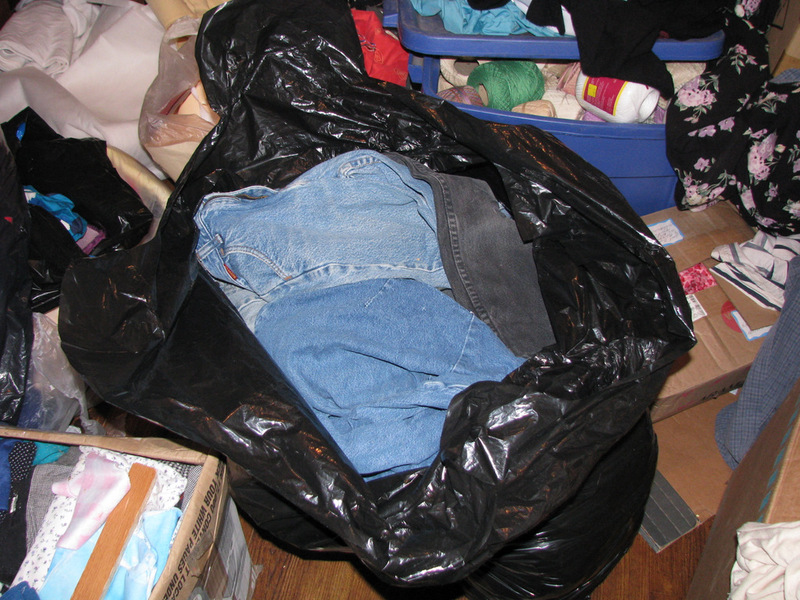 Then I spotted one of the biggest bags in my storage room and thought, ” That’s as good a place as any.” Looking inside, I discovered it was entirely filled with jeans. Thus was born my personal Stuff from Stuff- Jean Challenge. Now, I love a good challenge, in fact it is probably the most motivating thing in the world to me. Make it public and it is as good as done. Well, at least it will be done at some point. I am not a deadline lover. Challenges yes, deadlines no! So here are my rules: I also love rules, I know, I am working on the breaking the rules part to be a liberated artist- still another article to be written. I have also found that I cannot state things simply. I seem to have to explain every statement I make. Even my rules get kind of complicated. What is it with me? 1. Use the entire bag of jeans with as little waste as possible– that means any little scrap cut while making a project gets saved for making something else. I am going to put all scraps/waste into a basket as I go and try to empty it as best as possible and I will show the basket at the end of the challenge- hopefully near empty. 2. Post once a week on my progress to show the projects I am creating– I was thinking every Thursday but I know I can’t keep to a schedule so it will be sometime during the week. 3. Have Fun– This means not to let the rules stress me out, be overly concerned about what other people think and to spend time dreaming and making myself laugh. Well, there you have it. A challenge is born and I even have the first project done, which I will post next. But this challenge isn’t a single birth, no, that would be too simple. I have decided that this challenge will be the sibling of several other challenges. The parent of which is a new series called Stuff from Stuff. But, being the first one delivered, this will be my main focus and I will try not to get too bored and finish this challenge before I go share the others. If anyone wants to join me in this challenge or has some great used jean projects, I would love to hear about them. I have searched the web and I am looking for unusual projects as well as oldies and goodies.